First, because it’s such a fine and descriptive thing to do. All 14-year-old boys and me love onomatopoeia. Remember 8th grade English class? Stuff that sounds like its name? Blaaaaggghhh. Urp. Tinkle. Snap. Boom. Poop. Whip. Kung Pao Chicken. Second, verbifying nouns is the new American Dream. You probably know that ”˜blog’ is short for ”˜weblog’ which used to be an online diary kept by nerds. They tried to shorten it to ”˜webl’ but those of us in a certain demographic kept singing, “Weebles wobble but they don’t fall down.” Then we’d do a little dance and lose our train of bloggy thought. After more consideration, the Nerds In Charge decided ”˜blog’ was a better name because even though blogs wobble and quite often fall down, there’s no dance involved to lower productivity. It’s strange how we like to shorten so many of our words and yet we still say ”˜orthodontics’ and ”˜Episcopalian’ and ”˜dictionary.’ But maybe that’s just me. I live in the suburbs. So what does this have to do with blogging, you ask? Nothing. I just like doing my Weeble dance. 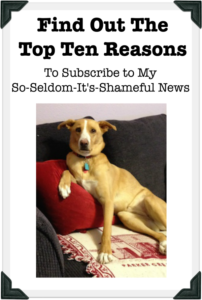 But, Becky, you ask, does humanity need another blog? Nope. And yet blogs are churned out faster than half-price lattes at Starbucks. So why am I joining the ranks of bloggers? To keep my writing muscle strong. To try out new ideas. To connect with readers who like my style. And why should you read my blog? Because someday I might teach you the Weeble dance. Do you write blogs? Do you read blogs? Why or why not? What do you like about blogs? What do you dislike? This entry was posted in Goofy Stuff, Stuff Worth Pondering, Writing, Reading and Publishing and tagged Becky Clark, humor, Kung Pao chicken, onomatopoeia, Starbucks, Weebles on September 1, 2008 by Becky. I just started a blog, too. What kind of novels do you write for teenagers? Mostly unpublished. How about you? Are you a writer too?